This program aims to support Francophones struggling with a mental health disorder in their recovery process and to encourage them to participate in community activities. This program aims to support Francophones struggling with a mental health disorder in their recovery process and to encourage them to participate in community activities. The Ateliers de l’Élan’s program offers various activities to promote the recovery of each participant, including artistic, physical, recreational and educational activities. 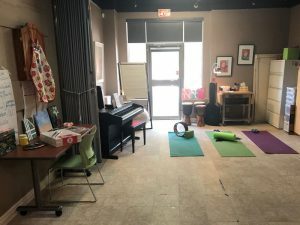 The artistic expression component of the program offers various workshops that foster the development of expressive talent through theatre, music, writing, painting and drawing, among others. Physical activities allow participants to develop healthy life habits and improve their physical fitness. For example, a walking club, fitness classes or yoga workshops are offered at the Ateliers de l’Élan. The recreational component offers leisure activities such as seasonal, cultural and social outings in order to encourage participants to have fun, to entertain themselves, to create and maintain social ties and to participate actively in the community. The recovery component offers activities that are relevant to the unique recovery approach of each person in order to enjoy an active and satisfying life. Programming focuses on disease management, growth, personal development and the achievement of wellness. The following workshops are offered on a regular basis: Individualized action plan for recovery (PEER/WRAP), communication, self-esteem, emotional integration and anger management. Admission to the program is done by contacting one of the coordinators for the recovery activities of the Ateliers de l’Élan at 613.742.0988, extension 600, or 613.744.2244. Peer support provides, among other things, opportunities for mutual assistance through volunteer opportunities such as facilitating workshops and participation in various committees. The contribution of peers is put to use in the associative life of the workshops of the Ateliers de l’Élan.